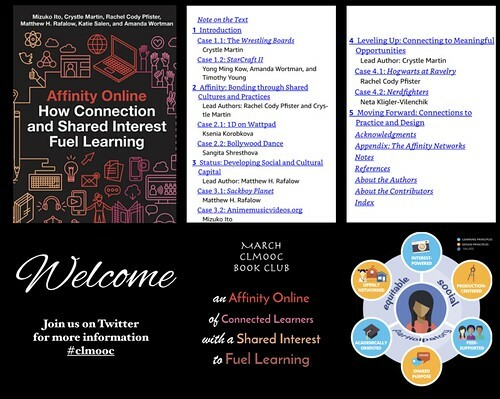 We’re reading Affinity Online: How Connections and Shared Interest Fuel Learning as a Connected Learning Massive Open Online Collaboration (CLMOOC) effort, and yesterday, I shared various ways you can read along with us, too, even if you don’t have the book. I’m about halfway through the book at this point and I find I am most interested in the vignettes the researchers have pulled together about people who are members of different Affinity Networks. 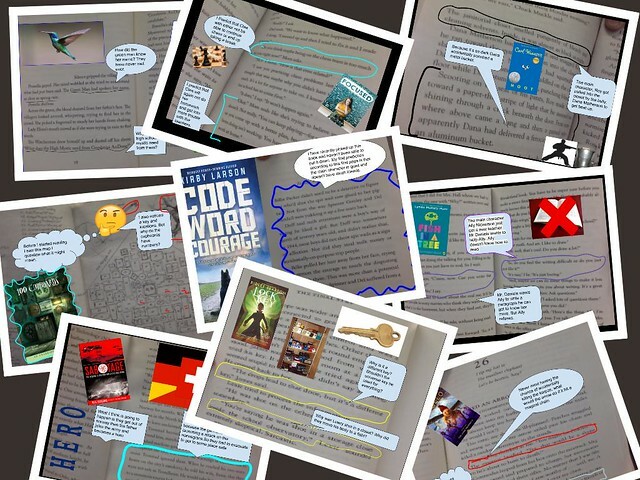 These stories — they call them Case Studies, as they are researched stories — bring to the surface the themes of the chapters, of course, but they also provide a window into the insider’s world of Affinity Networked Spaces. 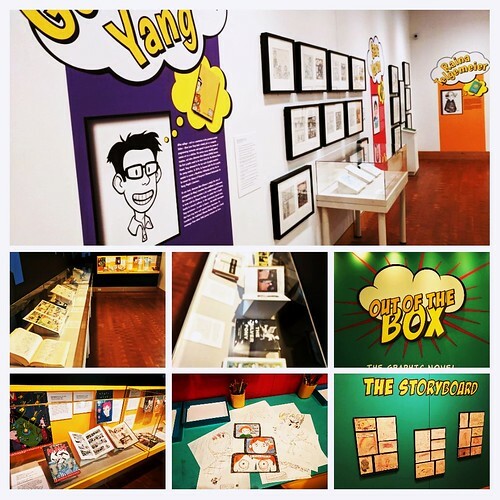 So, we learn about the way fans of wrestling have come together to form an interesting collection of fan writing and fictional competitions told through writing by the fans, connecting a love wrestling and competition with story and character creation/development. We see how a video game system — Star Craft II — had launched an entire universe of gamers and players who want more out of the game, and who have developed more, through strategic play and groupings, with writing at the heart of it all. On Wattpad writing app/home, a group of fans of the One Direction band have invented an entire niche site of fan fiction of the band, writing stories and making connections. They give feedback. They connect stories. They publish to an audience. Video, performance and culture are connecting points for Bollywood Dance, where the American children of immigrants remain connected to heritage through dance, and through shared dance routines and competitions. Making and sharing videos becomes a common compositional practice. 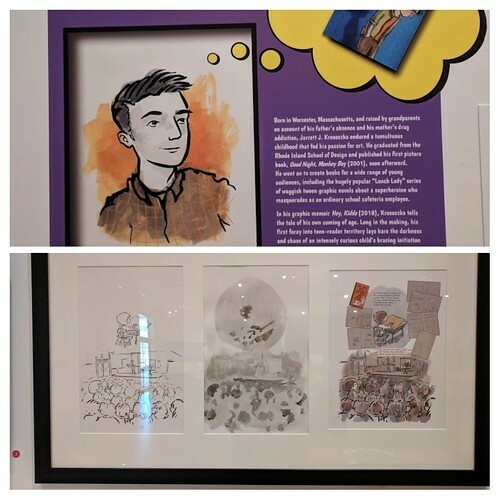 These are the first four Case Studies for the first two chapters, and what comes to the surface for many of these portraits is the importance of writing and identity, of how the use of an Affinity Network for expression depends upon representing yourself with words and media. This surfaces for me because, as a teacher, I often wonder where my intersection with students’ interest in Affinity Spaces might be. And no surprise — it comes back to writing as a skill from school that translates quite well into non-school activities. 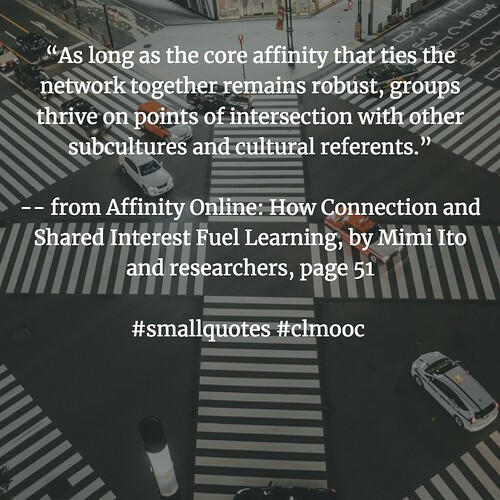 Even when an Affinity Network begins to create its own lexicon and style, writing words and sharing stories and making comments/feedback still are central elements, and those are all things schools can offer, even if the student feels disconnected from the classroom experiences. I’ll keep an eye out on other trends as I read deeper into the book and consider other Case Studies. 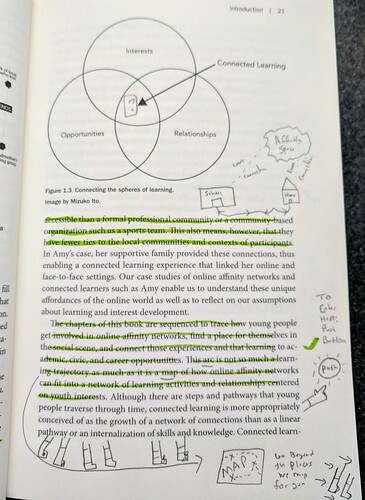 Since I splurged and bought Affinity Online, a book some of us are reading together in March in the Connected Learning Massive Open Online Collaboration (CLMOOC), I am free to mark the pages up as I see fit. Which I do, regularly. 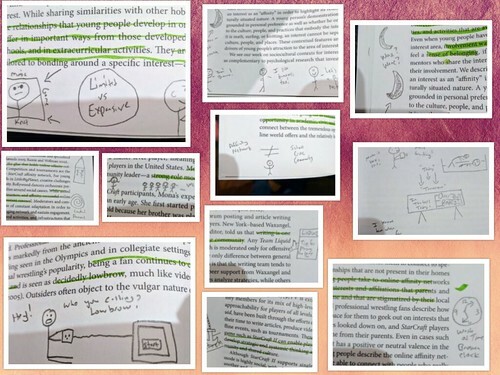 I use highlighters to mark text (and to find passages that I am sharing out) and doodles and drawings to represent my thinking. I was happy to see but not surprised to learn that my friend, Terry, has been doing something similar with his reading (although his process is a bit more complicated as he borrowed the book from the library and needed to photocopy the page). Terry is much more attuned to the colors — his mark-up is a piece of art. Mine is mere scribbles. 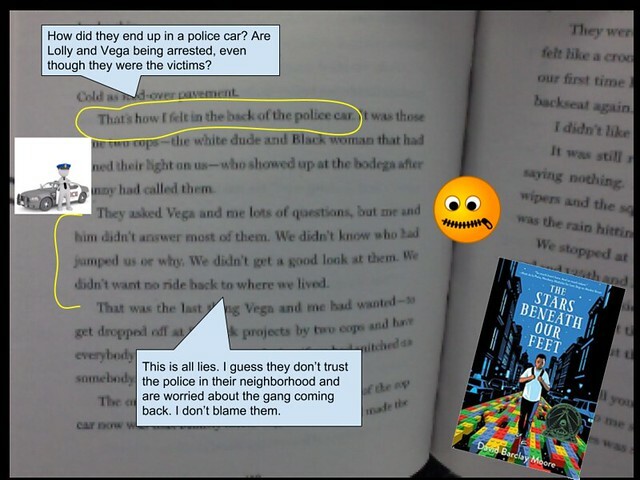 You can’t easily do this kind of annotation with digital versions of the book, which is why I bought it as physical book as opposed to a Kindle version or something else in ebook format. 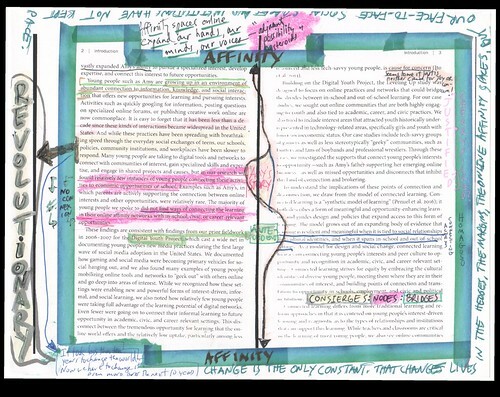 But, this also isolates the reader a bit to the single book/single page/single reader, and Daniel wondered on Twitter whether a digital version or excerpt of the book is online somewhere, so CLMOOC can use Hypothesis for crowd annotation, and well, I don’t know. But I’ll look around and see.